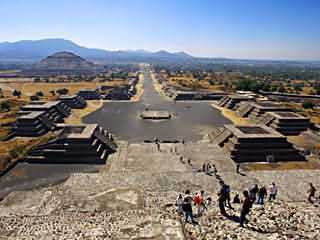 World Mysteries - Mystic Places: Teotihuacan, history, photos, astronomical alignment. 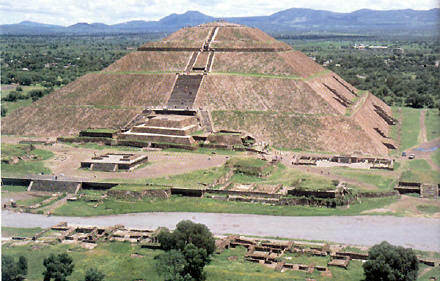 Teotihuacan means 'The City of the Gods", or "Where Men Become Gods" (in Nahuatl). It is located in the valley of the same name 30 miles north of Mexico City. 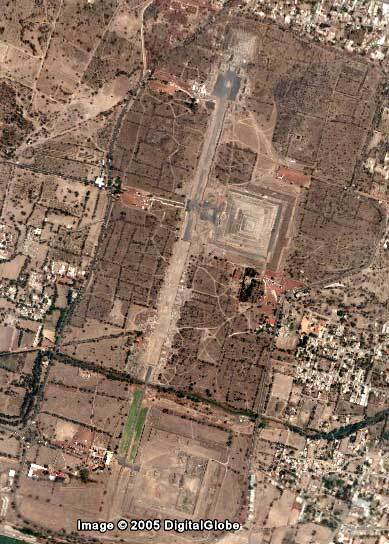 Below is an interactive Google Earth satellite map of Teotihuacan. 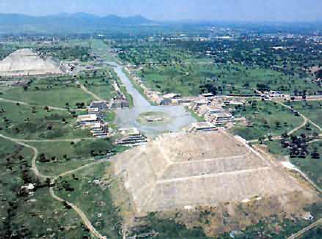 Teotihuacan used to be a thriving city and ceremonial center that predated the Aztecs by several centuries. 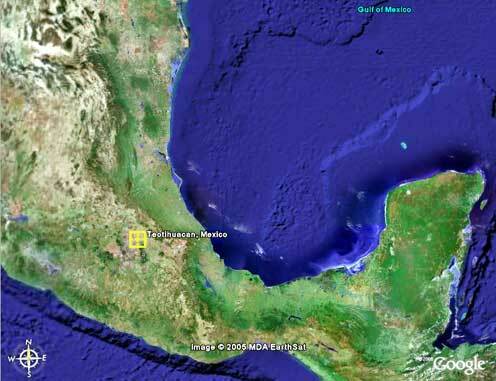 Most likely it was Mexico's biggest ancient city at its peak and the sixth largest city in the world in AD 600. Teotihuacan began declining sharply around 650 AD, and was almost completely abandoned around 750 AD. No one knows why. The city met its end around 700 AD through deliberate destruction and burning by the hand of unknown invaders. Although a century earlier, around AD 600, almost all of Teotihuacan's influence over the rest of Mesoamerica had ceased, indicating some sort of internal malaise or decline before the destruction. The first strains appeared about AD 650. 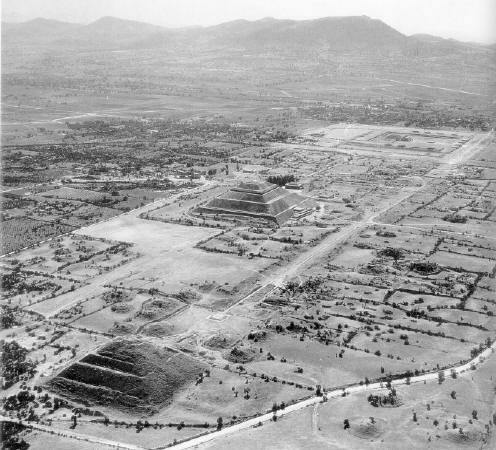 A century later, Teotihuacan was a shadow of its former self. The population had declined so rapidly that the once-proud city was now little more than a series of hamlets extending over an area of about a square kilometer. Some great catastrophe apparently struck the city in AD 700, reducing its population to below 70,000. Many of its people moved eastward. The city was deliberately burnt and destroyed. Over the years, its buildings collapsed and the pyramids became overgrown with dense vegetation. Away from the Avenue of the Dead, the city continued to live on for another two centuries, although the population of Teotihuacan sunk to only a quarter of its former total. Some sort of crisis overtook all the Classic civilizations of Mesoamerica (including the Maya) two centuries later, forcing them to abandon most of the cities. Some anthropologists believe the crisis may have been a lessening of the food supply caused by a drying out of the land and a loss of water sources to the area. They speculate that this might have been brought about by a combination of natural climactic shift towards aridness that appears to have happened all over Mexico during the Classic period and the residents having cut all the timber in the valley. Originally there were cedar, cypress, pine, and oak forests; today there are cactus, yucca, agave, and California pepper trees. This change in vegetation indicates a big climate shift. 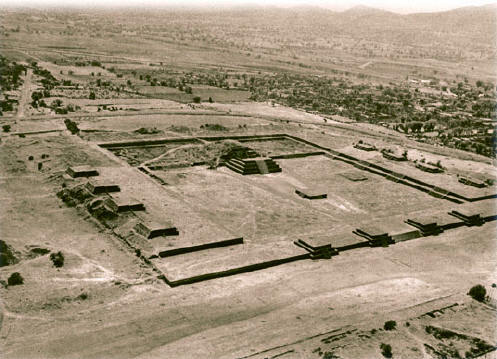 Although Teotihuacan presents a puzzle to archaeologists because it was a huge city that appears to have arisen without antecedents, the single most important fact which archaeologists have learned about the Classic period in Mexico was the supremacy of Teotihuacan. As the urbanized center of Mexico, with high population and tremendous production, its power was imposed through political and cultural means not only in its native highland habitat, but also along the tropical coasts, reaching even into the Maya area. It's trading and tribute empire was comparable with the Aztec empire that eventually followed it. All other Mexican states were partly or entirely dependent upon it for whatever achievements they attained. When Teotihuacan fell, around 650 AD, the unifying force in Mesoamerica was gone, and with it widespread inter-regional trade. The Late Classic period saw increasing fractionalization among cultures. In the place of great states, petty kingdoms and militarism arose. From the highpoint of civilization at Teotihuacan, wars became the rule of the day, and for those unfortunate enough to be captured, sacrifice to the gods. Military empires, such as the Toltecs in the twelfth century AD (and later the Aztecs, starting in fourteenth century AD), which grew up from these warring factions were the cultures met by the Spanish in 1519 and largely eradicated by 1521. Probably the reason that the Spanish were able to conquer the Aztecs in such a short amount of time had less to do with their skill as soldiers and more to do with the fact that the Spaniards physically resembled the descriptions in Aztec legends of the god Quetzalcoatl. Quetzalcoatl, while symbolized as a feathered serpent, appears also to have been an historic figure - the man credited with bringing civilization, learning, culture, the calendar, mathematics, metallurgy, astronomy, masonry, architecture, productive agriculture, knowledge of the healing properties of plants, law, crafts, the arts, and peace to the native people. He is pictured as a quite different physical type than the natives - fair skinned and ruddy complexioned, long nosed, and with a long beard. He was said to have arrived by boat from the east, and sailed off again years later promising to return someday. This sacred, truncated edifice stood 210 feet high and 650 feet square, a vast pyramid of rubble, adobe mud, and earth all faced with stone. A wooden temple on the summit of the pyramid afforded a spectacular view of the sprawling city below. 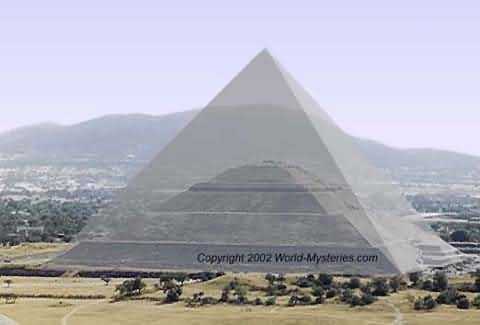 The pyramid is actually a succession of pyramids built one on top the other over the centuries. The pyramids and many other structures at Teotihuacan are stepped, rather than smooth sided like the Egyptian pyramids, and the stones of which they are made are not as large as stones used to build Egyptian pyramids. At its peak time - most of Teotihuacan was plastered, and the pyramids were painted bright red. Another fascinating feature of some of the pyramidal structures is that they contain a broad, thick layer of mica, which had to be brought from Brazil, over 2000 miles away! Mica is very flaky and fragile, yet it was brought in very large pieces from great distances (and without wheeled vehicles). Then the mica was used on an inner layer of the pyramid, not where it could be seen. Why? One characteristic of mica is that it is used as an insulator in electronic and electrical things. Was that its purpose here? Another mystery of Teotihuacan. 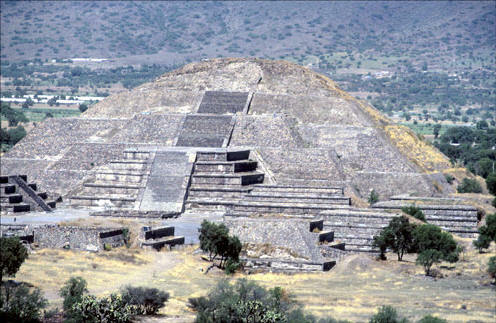 In 1971, a large cave underneath the Pyramid of the Sun was discovered which throws light on why the pyramid was constructed, and perhaps even on why Teotihuacan itself was built where it was. The cave is actually a natural lava tube enlarged and elaborated in ancient times. The Teotihuacan Valley is a side valley of the Valley of Mexico and is one of a number of natural basins in the midst of an extensive region of volcanoes, therefore, there are many caves formed from the tubes of old lava flows. 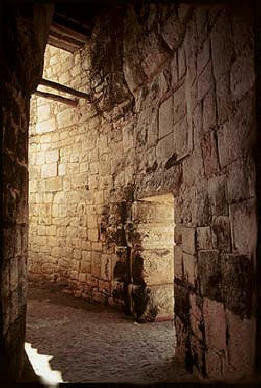 The ancient use of the cave predates the pyramid. 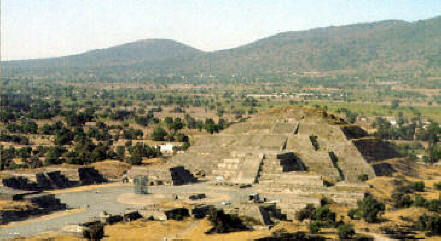 Aztec tradition placed the creation the Sun and Moon, and even the present universe, at Teotihuacan. In Pre-Spanish Mexico, such caverns were symbolic wombs from which gods like the Sun and the Moon, and the ancestors of mankind, emerged in the mythological past. This is an immensely holy spot and the memory of its location persisted into Aztec times. The current excavation under the Pyramid of the Moon may be one of the best opportunities to answer questions about the civilization, as its underlying older, primitive loose rock construction may have protected buried secrets by making it difficult to dig under and resistant to looters. 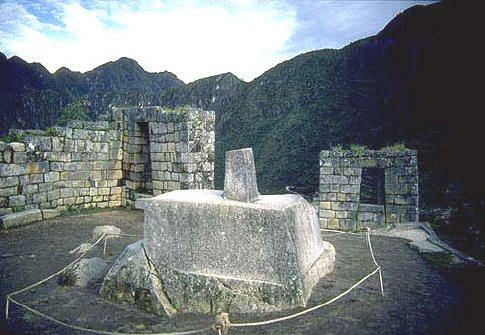 The Ciudadela is a huge enclosure located at the geographic center of the city. It measures about 400 m on a side (i.e. 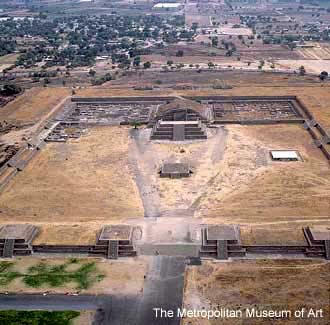 about 160,000 m2), and the interior space is surrounded by four large platforms surmounted by pyramids. The main plaza had a capacity of about 100,000 persons without much crowding (Cowgill 1983). One of the main functions of this closed huge space may have been ritual performance. 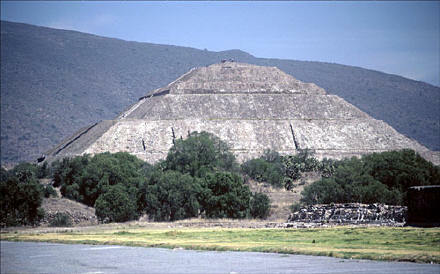 The Feathered Serpent Pyramid was the central pyramid of this large complex. Adorned with large sculptural heads, it was one of the most monumental structures in Teotihuacan. 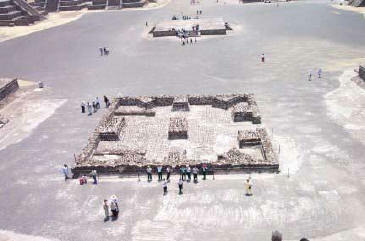 A major portion of the principal facade of the pyramid was later covered by the Adosada platform; afterward, the Feathered Serpent Pyramid was not clearly visible to people standing on the main plaza, as is shown in this photo. 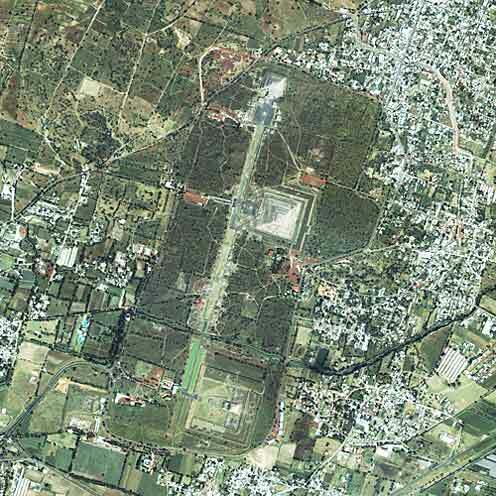 The city of Teotihuac�n is meticulously laid out on a grid which is offset 15�.5 from the cardinal points. Its main avenue, the "Street of the Dead," runs from 15�.5 east of north to 15�.5 west of south, while its most impressive structure, the Pyramid of the Sun, is directly oriented to a point 15�.5 north of west -- the position at which the sun sets on August 13. The sitting of the Pyramid of the Moon at the far end of the avenue was likewise done with such care that a sight-line directly over the top of the Pyramid of the Sun marks the meridian, thus allowing the priests of the city to fix the times of noon and midnight with complete accuracy. 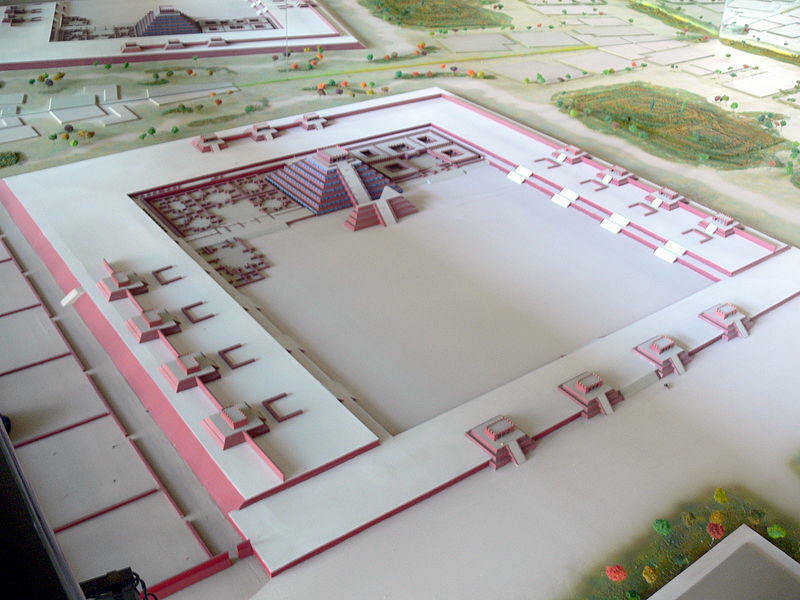 Several attempts had been made to explain the layout of Teotihuac�n by means of astronomy. 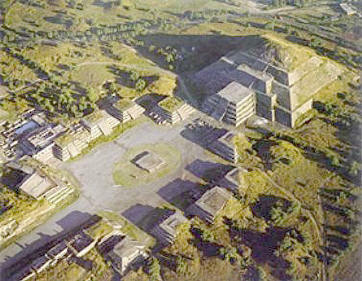 The only credible solution to the mystery of the orientation of Teotihuac�n (and other Mesoamerican cities and archaeological sites) is provided by Dr. Vincent H. Malmstr�m in his 1997 volume, "Cycles of the Sun, Mysteries of the Moon: The Calendar in Mesoamerican Civilization" published by the University of Texas Press. Here (with his permission) is a link to Chapter 5 of his book where he presents the main gist of his argument. The following images are the result of amazing hi-tech combination of satellite images with program called The Photographer�s Ephemeris which shows you the exact direction of where the sunrise and moonrise will be at any particular location and time using Google maps. Pyramid of the Sun at Teotihuacan. Orange line shows sunset on Aug 13. Click to enlarge. The Ciudadela at Teotihuacan. Orange line shows sunset on Aug 13. Click to enlarge. 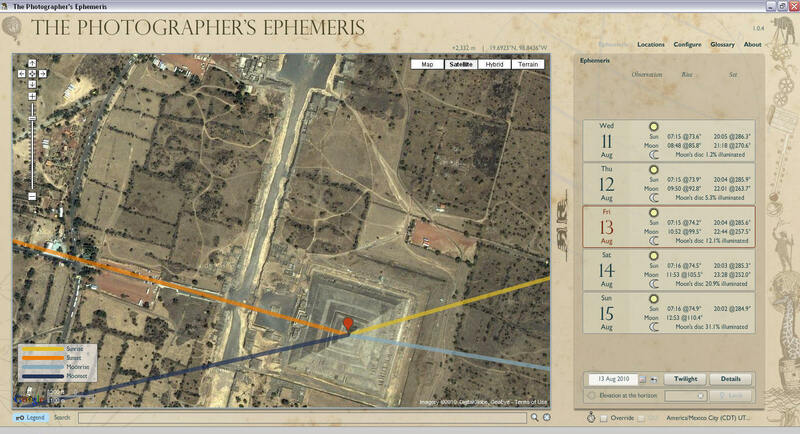 The Photographer�s Ephemeris (TPE) is a free application for Mac/Windows/Linux designed for landscape photographers. It shows you the exact direction of where the sunrise and moonrise will be at any particular location and time using Google maps. Landscape photographers typically wishing to plan their shoots around the times of sunrise/sunset or twilight, or alternatively when the moon is in a particular place or a particular phase. Click on the logo to learn more and download this free program. The largest metropolis of the pre-Columbian New World, Teotihuac�n numbered in its heyday perhaps as many as 200,000 inhabitants. It is meticulously laid out on a grid which is offset 15�.5 from the cardinal points. Thus, its main avenue, the "Street of the Dead," runs from 15�.5 east of north to 15�.5 west of south, while its most impressive structure, the Pyramid of the Sun, is directly oriented to a point 15�.5 north of west -- the position at which the sun sets on August 13. The siting of the Pyramid of the Moon at the far end of the avenue was likewise done with such care that a sight-line directly over the top of the Pyramid of the Sun marks the meridian, thus allowing the priests of the city to fix the times of noon and midnight with complete accuracy. 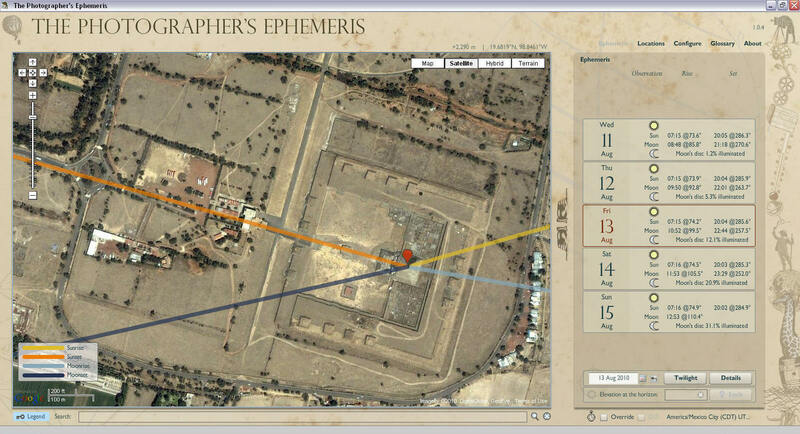 A brief examination of the ephemeris reveales that the sun passed through the latitude of 14�.8 N on April 30 on its way northward and again on August 13 on its way southward. That happens to be the latitude of Izapa, in southernmost Mexico, and August 13 happens to be the date that the Maya believed the world began -- and here we find that date commemorated in the layout of the largest pre-Columbian city ever to be constructed in the New World, a thousand kilometers and a thousand years away from where it all began. A word about solsticial alignments in Mesoamerica: Even though the region extends through 10 degrees of latitude -- from about 13 to 23� N -- because it lies so near the equator, sun angles scarcely differ by more than a degree across the entire region, in other words, less than could be distinguished by someone practicing naked-eye astronomy as these people did. For all intents and purposes, the azimuth of the summer solstice sunrise can be equated to 65� throughout the region, or 25� north of east. Similarly, the winter solstice sunrise can be equated to 115�, or 25� south of east. Sunset positions on each of these days may be marked against the corresponding positions along the western horizon -- i.e., 295�, or 25� north of west for the summer solstice, and 245�, or 25� south of west for the winter solstice. Naturally, none of the Mesoamerican peoples reckoned in terms of angles or degrees, so although we express such measurements in these units, the alignments which they established were done solely through repeated observations in the field. It is, however, not inconceivable that, having once realized what the extreme points of the sun were, they made a graphic representation of its limits. If so, the resultant diagram would have approximated a recumbent cross -- a so-called Saint Andrew's cross -- which indeed has been recognized as one of the most frequently repeated artistic motifs used by the Olmecs. 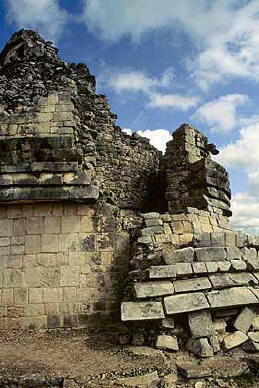 Sometime during its six to eight centuries of existence, La Venta witnessed the construction of a new series of structures (the so-called Stirling Complex) near the southern end of its great plaza. Interestingly, when these structures were first mapped, they were shown to have deviated some 23�.5 from the site's axis, which, as we have explained, is aimed 8� west of north. The fact that this angle corresponds to the inclination of the earth's axis is probably strictly a coincidence, but in any case, it means that the walls of the Stirling Complex are oriented 15�.5 off of the cardinal points. Thus, in a northerly direction it has an azimuth of 15�.5, in an easterly direction it faces 105�.5, to the south the azimuth reads 195�.5, and to the west, 285�.5. Only the latter of these azimuths is of any interest, because it marks the sunset position on August 13 -- "the day that time began," according to the sacred almanac. Could this alignment be an architectural "reinforcement" of a topographic orientation toward Cerro San Mart�n and/or Cerro Santa Martha? If so, it could mean that by about 1000 B.C., priests at La Venta had come up with a formula for recording when the zenithal sun was passing overhead at Izapa! In reality, the formula was as simple as it was ingenious. The problem at San Lorenzo had been that the priests had no way of knowing when it was August 13, because in their part of the world the zenithal passage of the sun did not occur on that date. Thus, they had settled on using one of the solstices instead, because the date of the sun's turning point was the same everywhere, they had discovered. Whereas at San Lorenzo they were obliged to use the winter solstice sunset to calibrate their calendar, when La Venta was founded it appears that they could once more think in terms of the summer solstice, as had originally been done in Izapa. Indeed, the only difference was that instead of marking the sunrise as they did at Izapa, they were obliged to use the sunset at La Venta. Thus, no matter where one wanted to build a ceremonial center, one could always find out when it was August 13. All that was required was to count 52 days from the time that the sun turns around in the north and mark the horizon at sunset! Many scholars outside the established academic circles, have produced extensive evidence that the precise arrangement, proportion and alignment of many ancient monuments expresses, at the very least, advanced and detailed astronomical knowledge well beyond that with which their builders have been credited. 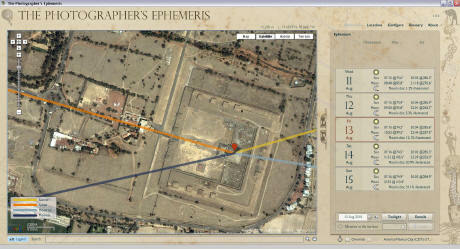 The Pyramid of the Sun and the Great Pyramid of Egypt are almost or very nearly equal to one another in base perimeter. The Pyramid of the Sun is "almost" half the height of the Great Pyramid. There is a slight difference. The Great Pyramid is 1.03 - times larger than the base of the Pyramid of the Sun. Conversely, the base of the Pyramid of the Sun is 97% of the Great Pyramid's base. 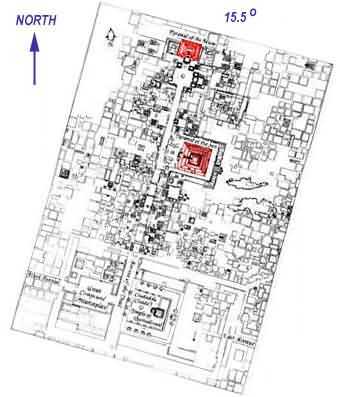 For very interesting and more detailed comparison visit http://www.nexusjournal.com/Reynolds.html - the Great Pyramid of Khufu and the Pyramid of the Sun at Teotihuacan - A Comparative Geometric Analysis. Beckmann, Petr. A History of pi. (New York: The Golem Press, 1971). To order this book from Amazon.com, click here. Cook, Theodore Andrea. The Curves of Life (New York: Dover Publications, Inc., 1979). To order this book from Amazon.com, click here. Euclid. The Thirteen Books on the Elements. Thomas L. Heath, trans. (New York: Dover Publications, Inc., 1956). To order this book from Amazon.com, click here. Erlande-Brandenburg, Alain. Cathedrals and Castles: Building in the Middle Ages (New York: Harry N. Abrams, 1995). To order this book from Amazon.com, click here. Garland, Trudi Hammel. Math and Music (Palo Alto: Dale Seymour Publications, 1995). To order this book from Amazon.com, click here. Hall, Manly P. The Secret Teachings of All Ages (Los Angeles: The Philosophical Research Society, 1988). To order this book from Amazon.com, click here. Hambidge, Jay. The Elements of Dynamic Symmetry (New York: Dover Publications, 1967). To order this book from Amazon.com, click here. Hancock, Graham. Fingerprints of the Gods (New York: Crown Trade Paperbacks, 1995). To order this book from Amazon.com, click here. Lawlor, Robert. Sacred Geometry. (London: Thames and Hudson, 1982).To order this book from Amazon.com, click here. McClain, Ernest G. The Myth of Invariance (York Beach: Nicolas-Hays, 1976). To order this book from Amazon.com, click here. Michell, John. New View Over Atlantis (London: Thames & Hudson, 1983). To order this book from Amazon.com, click here. Plato. Timaeus and Critias. Desmond Lee, trans. (London: Penguin Books, 1965). To order this book from Amazon.com, click here. Schneider, Michael. The Beginners Guide to Constructing the Universe (New York: Harper Collins, 1995). To order this book from Amazon.com, click here. Schwaller de Lubicz, Rene A. The Egyptian Miracle (Rochester: Inner Traditions International, 1988). To order this book from Amazon.com, click here. Schwaller de Lubicz, Rene A. Sacred Science (Rochester: Inner Traditions International, 1988). To order this book from Amazon.com, click here. Schwaller de Lubicz, Rene A., The Temple of Man. 2 volumes (Rochester: Inner Traditions International, Ltd., 1998. To order this book from Amazon.com, click here. Thompson, D'Arcy Wentworth. On Growth and Form (New York: Dover Publications, 1992). To order this book from Amazon.com, click here. Tompkins, Peter. Secrets of the Great Pyramid (New York: Harper Collins, 1971). To order this book from Amazon.com, click here. Long before Columbus, the Maya established one of the most highly developed civilizations of their time in the jungles of Mexico and Central America. Yet this advanced society of priests, astronomers, artisans, and farmers suddenly and mysteriously collapsed more than a thousand years ago. Accompany archeologists to Copan, Dos Pilas, and other spectacular Classic Maya ruins as they unearth artifacts and huge temples of incredible beauty. Recently deciphered hieroglyphics and other new discoveries offer astounding clues to the lives of these ancient people. You'll hear the startling story of one kingdom's downfall and its final desperate hours of violent warfare. Through spine-tingling recreations, witness ancient rituals reenacted on sites where they originally occurred. And meet the enduring Maya who still maintain many of their ancestor's traditions. You'll hear the voices of a magnificent civilization as you uncover LOST KINGDOMS OF THE MAYA. When Europe was in the Dark Ages, great cities were flourishing in Central America. This video explores how the Aztec and Mayan empires rose to startling heights and then mysteriously collapsed. When the Spanish conquistador Hern�n Cort�s landed in 1519 in what is today Mexico, he and his soldiers were dumbfounded by the large cities they encountered. Using innovative computer graphics, this video shows what the great Aztec urban centers might have looked like when Cort�s and his men first saw them. The Mayan empire, which flourished before the Aztecs, from approximately 300 to 900 A.D., is also examined in this video, which pays particular attention to how some Mayan influence still resonates in contemporary Mexico. The Mayans and Aztecs developed complex and intelligent societies, and much of their culture is still mysterious to us, but this video does a good job of explaining the basic history of who these people were and how they lived. The video also presents the story of New Yorker John L. Stephens, who traveled to Central America in 1839 and brought back tales of great pyramids rising out of the jungle to an astonished public. The history in this video is intelligent and the technical innovations, such as the computer-generated lost cities of the Mayans and Aztecs, make for an enjoyable and interesting presentation.